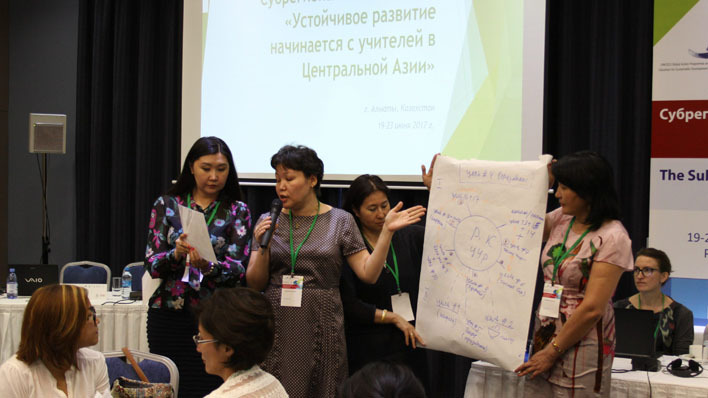 On June 19-23, 2017, Almaty hosted a workshop for teacher educators of Central Asian countries on the UNESCO project. This is a global initiative to increase the professional level of pedagogical staff for the implementation of education for sustainable development through the training of teachers. The UNESCO Cluster Office for Central Asia in Almaty organized the workshop, in cooperation with the UNESCO Asia-Pacific Regional Bureau for Education, UNESCO Tashkent, the Asia-Pacific Education Centre for International Understanding under auspices of UNESCO (APCEIU), and the Regional Environmental Centre for Central Asia (CAREC). The event received financial support from the Japanese government. 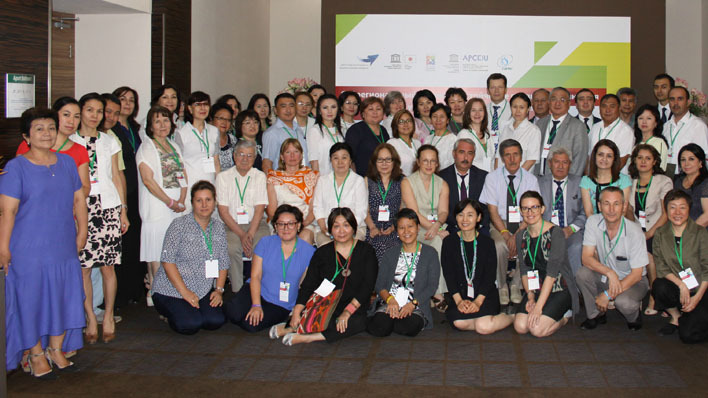 70 experts from 9 countries, including representatives of ministries, universities, and teacher training institutions from Central Asia, and international experts from the Republic of Korea, Sweden, Georgia, and Philippines attended the workshop. The workshop introduced a new methodology, whereby each participating institution conducted a self-assessment on education for sustainable development (ESD) and global citizenship education (GCED) before the workshop. During the workshop, participants explored a variety of methods and approaches, which show different models of mainstreaming the 21st century skills. As a result, they developed action plans to implement subsequent changes in their institutions and teacher education and training systems in the region. The teacher education institutions will start implementing their action plans over the following nine months and meet again in Tashkent in April 2018. Key speakers and organizers shared their thoughts on the workshop results, the importance of promoting education for sustainable development and global citizenship concepts, and values necessary for achieving quality education. «The main reason why these people are here is that the current education is not able to prepare the young generation to solve the problems of the 21st century. People like me cannot solve them because I am part of these problems: the way I think, the way I was educated and the way I define success have created these problems. But young people can confront these challenges in a different way. They can do it if we help them to learn differently, if we teach them how to think critically, if they will learn how to learn. «When we talk about education in terms of sustainable development it is not just about “you are getting there by these means”. It should be an ongoing and continuing process with the involvement of all stakeholders. Of course, it is not easy to change the education system and mindset of educators, but doing this workshop, however small, is meaningful for sharing experience and raising the awareness. «Sustainable development demands a lot of re-thinking from all of us, about what we consider important in our lives, about our future, about our values… And education is critical in that process, to support all of us in changing the way we think, the way we live. There is no single method or solution for sustainable development. If there were, if it were that simple, then the whole world would not be struggling for sustainable development today. Different countries have different contexts. Even within one country, issues manifest differently in different communities. So, every community needs to look around, think and explore because solutions come from you, not from someone else who will tell you what to do. «This workshop focused on education for sustainable development and global citizenship. They are crucial for developing non-cognitive competences for the 21st century. These skills can enable students to get future jobs and have sustainable development in their countries. The workshop helped to establish synergies among teacher training, education policy, curriculum, and innovative pedagogical approaches. The participants of the workshop acquired the necessary knowledge and attitudes to transfer them to their students. Their skills combined with a fresh perspective can create transformation not just in their institutions but also in their countries. « This workshop differs from many seminars, training and meetings on education for sustainable development (ESD) with its practical focus on changes towards sustainable development and ESD in the organizations themselves, preparing future teachers - universities and teachers training' centers. The workshop provided an opportunity to think about changes not only at the national level - political and legal but also about real changes in the minds, hearts, behavior, and lifestyle of teachers and their students. You can download workshop's programme and concept note here: 1UNESCO Workshop_Agenda.docx Concept Paper_SD-GCED 1.docx .